Stuck on what to post on Instagram stories? 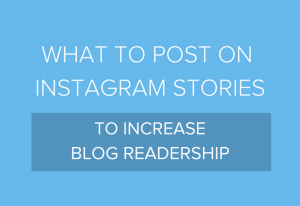 If you have just started using Instagram to grow your business or blog, one thing that might be on your mind is what to post on Instagram Stories. Instagram Stories are a feature within Instagram that you can use to share photos and videos that disappear after 24 hours. The content that you share on Instagram Stories can be a little less ‘perfect’ than what you post to the grid and it is the perfect way to keep your audience entertained in between Instagram grid posts. You can upload photos from your camera roll and take them ‘in the moment’. Or even share posts from other Instagrammers straight to your Instagram Stories. The same goes for Instagram videos but something you need to keep in mind with Instagram Stories videos is that they need to be 15 seconds in length. They can be really fun when you get the hang of them (and remember to post them!). 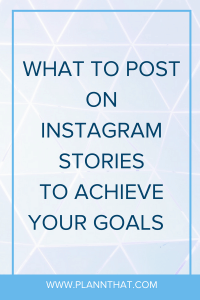 But if you really want to achieve your goals with Instagram, it’s important to know what to post on Instagram Stories. If you want to increase product sales using Instagram Stories content, here are a few things that you need to keep in mind. Of course, it can be tempting to start posting photos of your products in every single Instagram Story with your pricing and link to buy. However, this can get boring really quickly! If you ‘spam’ your Instagram audience with promotional product posts all the time your stories views are going to start dropping fast. Whether you’ve just started your blog OR you’ve been blogging for a while, there always comes a time when you all you want is more people reading your blogs! I mean, why write them if no one is going to read them?! Sure, it’s fun to write blogs (I absolutely L-O-V-E writing to you lovely peeps!). But it is important to keep an eye on your weekly and monthly blog readership. PSSST -> We have a whole blog post with tips on how you can use Instagram Stories polls to grow your blog… want to take a peek?! Who doesn’t want to gain a few new Instagram followers? 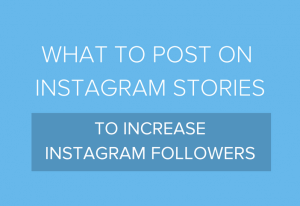 With Instagram Stories you can definitely increase your followers. Remember, you need to be really strategic about what you’re posting to make it happen. PSSST -> For more Instagram Stories hacks like adding invisible hashtags be sure to check out this handy dandy blog post! If you offer a service like hairstyling, makeup application, coaching or personal training, you can definitely use Instagram Stories to increase those bookings! But, just like the other goals, you need to be strategic with what you share to your Instagram Stories! Promoting services is similar to promoting products. That is, you don’t want to over promote your services by focusing on sharing your discounted service offer for the month every single day. Instead, you need to have a variety of content that encourages your audience gently to want to take the step to book in for your service. Wowza! Now you have a whole bunch of Instagram Stories tips to put to action. We can’t wait to see what you create and how you go with your new Instagram Stories content ideas up your sleeve.